Posted on 12/12/2017 at 08:42 AM. 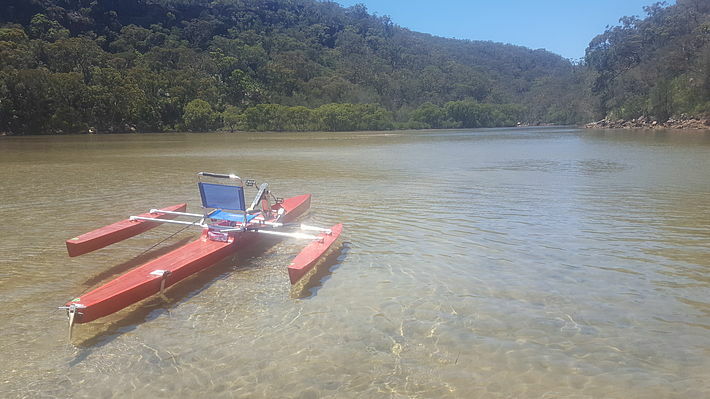 I have finally got the new pedal kayak on the water - not bad speed at thirteen and a half kmh top speed achieved yesterday, cruising about 9kmh. The destination was Coal and Candle Creek - the fly rod came along in order to make it a proper sea trial. The fishing diary indicated that the tailor are running at this time, and indeed there were a few bust-ups as I headed up the arm, but no takes. The water was very clear, so I switched from 30lb leader down to 12lb, and put on a bigger teal-coloured fly to match the baitfish. Almost immediately I had a good take, but lost that one to a pulled hook. No other takes for a while, and it wasn't until the way back that there was another good bust up - I arrived in time to see a school of rat kings on the surface. A great first cast past the school, and as soon as the fly hit the water and started moving, the whole school just turned and attacked it. This guy went 55cm, but was a good fight on 12lb. Thanks to the 30+m of water, I was able to back off the drag and not put too much hurt on. This is the first time I've seen kingies there, although my PB is from Warratah Bay further up the system. There were loads of garfish over the sandflats and a few in open water, and lots of ~5cm teal-coloured bait fish. Posted on 12/12/2017 at 08:45 AM. Posted on 12/12/2017 at 08:46 AM. Posted on 12/12/2017 at 11:26 AM. Stable looking setup - must be great for fly casting - might benefit from some kind of stripping basket on the cross rails to manage line and keep the coils away from the pedals in the wind. Posted on 13/12/2017 at 05:26 PM. In flat water, I can stand no worries, but like any small boat, it's a bit tetchy to stand in bigger chop. At least in the small boat I can get close in. 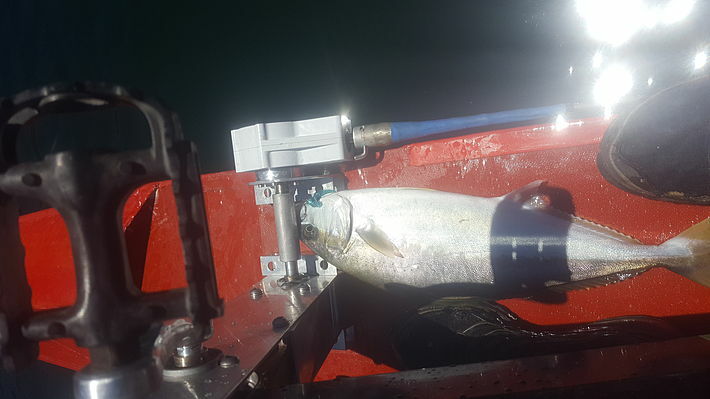 No kings hooked today - there were only a few about, and they are hard to find as I also haven't yet hooked up my sounder.